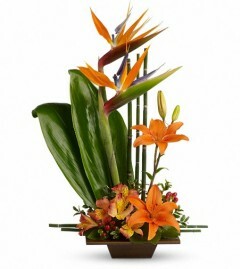 This Zen-inspired floral arrangement would be stunning in a business setting or at home. 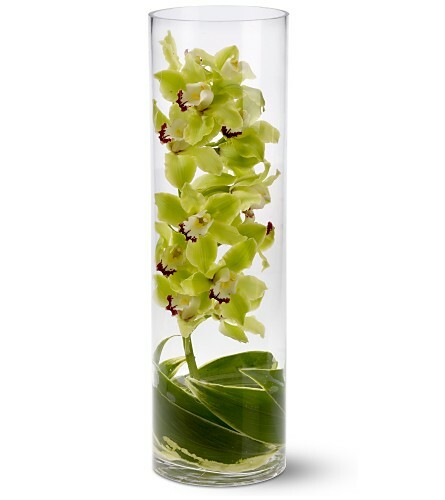 A green cymbidium orchid stem is presented in a cylindrical glass vase, lined at the bottom with ti leaves. 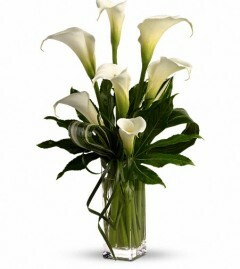 The Exotic Vase Arrangement Includes. Looking for something with a bit of Zen? Birds of paradise complemented by a stunning mix of tropical orange flowers and greenery in a graceful bamboo container, this bouquet is it.Birds of paradise, asiatic lilies, alstroemeria, red hypercium, accented with ti and galax leaves arrive in a container. A vision in green and white, this definitely is not your garden-variety bouquet!